VIDEO: Teresa Johnston leave hospital after suffering severe brain trauma from a 40-foot tree that fell on her during storm. An Irvine girl who suffered severe injuries after a tree fell on her during a recent storm is out of her coma and headed home with her family and friends. After going through brain surgery and being in a medically induced coma for more than a week, Teresa Johnston has recovered enough to go home with her parents. The incident happened around 5 p.m. Feb. 17, when a tree around 40 feet tall collapsed as Teresa was walking alone through a neighborhood greenbelt near Dewberry and Sandburg in Irvine, California. Teresa suffered severe brain trauma and fractures to her face and spine. This entry was posted in Local News on April 7, 2017 by Jeff Gritchen. Fifteen homeless military veterans now live in the innovative Potter’s Lane housing complex constructed from used shipping containers. Potter’s Lane is the nation’s first permanent housing for the homeless built with shipping containers. Three 20-foot containers are joined together to create a 480-square-foot studio apartment. Each unit is fully furnished and has a bathroom, kitchen and television. This entry was posted in Local News on April 3, 2017 by Jeff Gritchen. VIDEO: Homeless veteran whose family was killed 20 years ago gets a chance to rebuild his life. Homeless Army veteran Dean Harrell’s family was killed in an auto accident in 1998. Since then he found himself homeless, moving from hotel to hotel and most recently living in a shelter in Santa Ana. In March he moved in to his own studio apartment created from three shipping containers in a new complex named Potter’s Lane. The 16-unit micro housing project in Midway City. Constructed and managed by the nonprofit American Family Housing, whose headquarters are right next door, Potter’s Lane has attracted wide attention as an innovative approach to a stubborn problem: quick and affordable housing. It’s the first such permanent housing complex for the homeless in California created from modified shipping containers and possibly the only one nationwide. This entry was posted in Local News on March 29, 2017 by Jeff Gritchen. 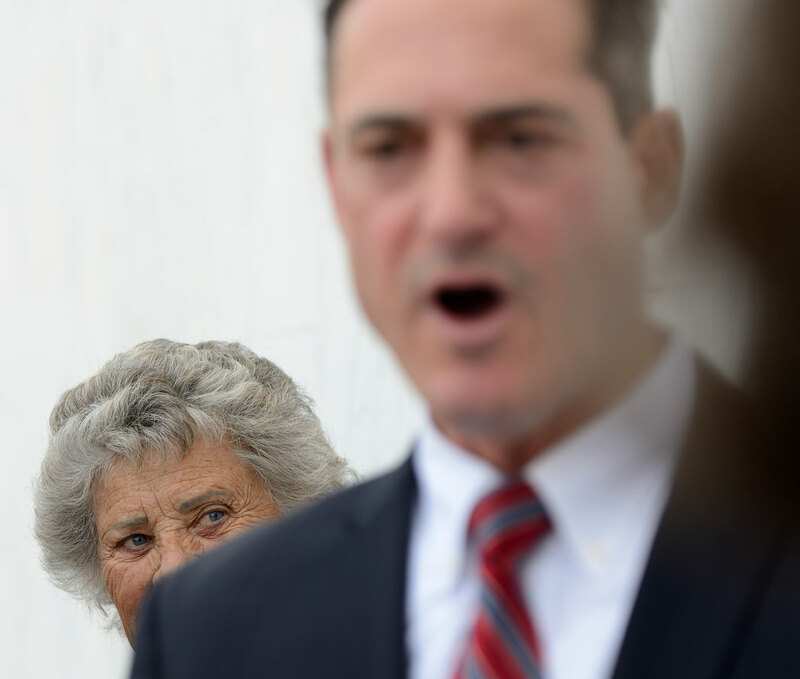 David Hastings said he was led away from the Orange County Jail medical wing just after midnight on April 5, 2014, wearing nothing more than a white, paper, jail-issue jump suit. His hands and feet were shackled to his waist. In the chilly darkness, he was being extradited from the Men’s Central Jail in Santa Ana to face a judge in Ft. Myers. Hastings said he spent the next 15 days hurtling across more than 8,000 miles, zig-zagging across 31 states and picking up 33 prisoners. During the ride, Hastings would be introduced to the grueling world of inmate transportation, where two-agent teams, driving all day and night, move people in custody across America. This entry was posted in Local News on March 23, 2017 by Jeff Gritchen. Newport Beach man has his own stem cells injected in to his brain and sees improvement in Alzheimer’s Disease. Dr. Christopher recently finished phase one of clinical trials on a new treatment for Alzheimer’s disease called intra-cerebro ventricular injection of autologous mesenchymal stem cells. He basically took fat cells from Jack Sage’s body, spun them down to stem cells and then injected them back in to Sage’s brain. The first phase of the trial was just to see if the procedure was safe – but the real effect has been a measurable improvement in Jack Sage’s Alzheimer’s symptoms. More than eight years after his brain went foggy, four years after he was diagnosed with Alzheimer’s disease and two years since he began an innovative and extremely invasive therapy, Sage said he is being flooded by memories that seem new, or, at the very least, feel easier to retrieve. His doctor, Christopher Duma, hopes Jack Sage goes down in history as the one-man turning point in the treatment of Alzheimer’s disease. This entry was posted in Local News on March 4, 2017 by Jeff Gritchen. YORBA LINDA – What do Presidents George Washington, Abraham Lincoln and Thomas Jefferson have in common? They were all in Yorba Linda on Monday celebrating Presidents Day. A trio of actors portrayed the presidents and, along with the Air Force Band of the Golden West, entertained close to 5,000 guests at the Nixon Presidential Library & Museum. Lincoln Pindroh, 9, of Placentia, entered the library dressed as his namesake, complete with a long black coat and stove pipe hat. Pindroh said he loves Lincoln because they share a name. “He saved the slaves… and I love that,” he added. Pindroh said he is planning to bring Lincoln cupcakes to school for his own birthday on Tuesday. As presidents Lincoln and Jefferson posed for pictures inside, President George Washington, played by Gary Beard, walked the line of people waiting, keeping in character as he greeted folks and let children wear his three-pointed hat. Beard has been portraying Washington at the library since 1999. The Nixon Library, which was renovated last year, has three free days a year: President Richard Nixon’s birthday on Jan. 9, First Lady Pat Nixon’s birthday on March 16 and Presidents Day. Presidents Day is always the busiest, but Joe Lopez, ‎communications director for the Richard Nixon Foundation, said this year’s holiday was expected to break a record for attendance. This entry was posted in Local News on February 20, 2017 by Jeff Gritchen. On Feb. 19, 1942, the Japanese American community in Southern California — the nation’s largest — was horrified by President Roosevelt’s Executive Order 9066. It declared the government’s intent to treat some part of the West Coast as a war zone, complete with powers that suspended some constitutional guarantees. Soon, Japanese Americans up and down the West Coast were told to pack their things, sell or give away what they could, and prepare for the unknown. What had happend a century earlier to Native Americans, and what was happening again to Jews in much of Europe, was about to happen to Japanese Americans — forced relocation. This entry was posted in Local News on February 19, 2017 by Jeff Gritchen. This entry was posted in Local News on February 17, 2017 by Jeff Gritchen. Every surfer knows you should stay out of the water for 72 hours after it rains. Bacteria has washed into the ocean, trash and big tree branches are floating around and, overall, it’s just a mess. But when the waves show – some surfers just can’t help themselves. Big surf on Tuesday brought waves up to 10 foot in Seal Beach and Huntington Beach. Surfers ignored warnings and paddled out into frothy, foamy, slamming surf, catching some epic rides but also taking some serious spills. Seal Beach Marine Safety Officer Nick Bolin said about 100 surfers paddled out on the south side of the pier, an area known for its pounding shorebreak. The expert-only spot brought out some big names, including World Tour surfers Kanoa Igarashi and Jordy Smith, to take on the barreling surf. This entry was posted in Local News on January 25, 2017 by Jeff Gritchen. This entry was posted in Local News on November 29, 2016 by Jeff Gritchen. This is what happens when you put a GoPro on a pig. 8-month old swines competes in the All-Alaskan Racing Pig Races at the OC Fair on Saturday, July 30, 2016. This entry was posted in Local News on June 28, 2016 by Jeff Gritchen. These were two of the oddest press conferences I’ve ever seen. First, Orange County District Attorney Tony Rackauckas held a press conference to tell the media that he accusing County Supervisor Todd Spitzer of impersonating an OCDA assistant district attorney – Rackauckas said Spitzer failed to identify himself as a ‘former’ assistant district attorney in an automated call supporting Measure A that went out to voters last week. Measure A calls for an ethics commission, partly prompted by Rackauckas “snitch scandal”. The OCDA was checking media credential a the door, only allowing certain media to attend the presser. When it was over, Shirley Grindle, the lead author of Measure A, was outside with Spitzer waiting to have their own press conference. This entry was posted in Local News on May 31, 2016 by Jeff Gritchen. 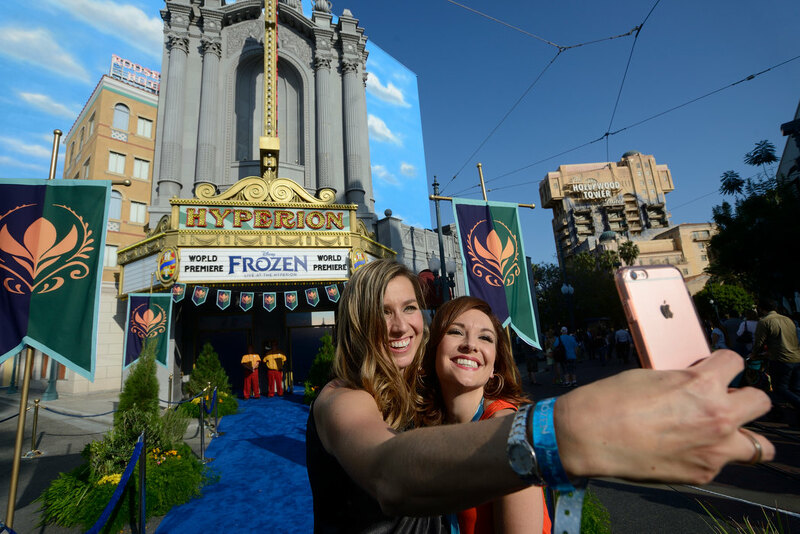 Laura Hollender, left, and Mellisa Paul, of Sacramento, take a selfie before entering the World Premiere of “Frozen – Live at the Hyperion” at Disney California Adventure in Anaheim on Thursday. This entry was posted in Local News on May 26, 2016 by Jeff Gritchen.